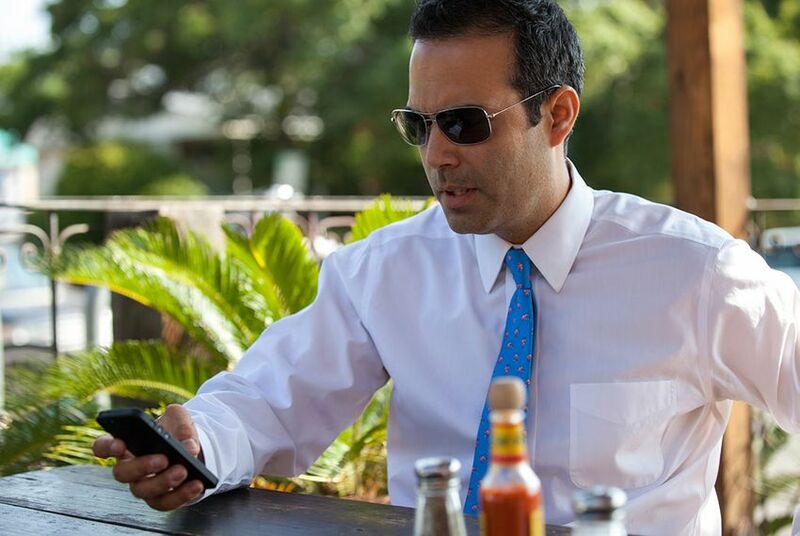 In his first in-depth interview on environmental policy, land commissioner hopeful George P. Bush's views on global warming and renewable energy set him apart from the Tea Party conservatives he has aligned himself with. On the campaign trail in Texas for a little-known statewide office, George P. Bush is generally toeing the Republican Party line: He is attacking federal health care reform, decrying abortion and championing gun rights. But it is environmental policy that will be under his purview in November if he wins his race to be Texas’ next land commissioner, a very likely outcome. Last week, in his first in-depth interview on the topic nearly a year and a half into his campaign, the son of former Gov. Jeb Bush of Florida, nephew of former President George W. Bush and grandson of former President George H.W. Bush sounded like anything but the Tea Party conservatives he has aligned himself with. For starters, the younger Bush thinks climate change is a serious threat to Texas, though he stopped short of definitively attributing a hotter and drier state to human activity. “I think people can agree that there has been warming in recent years,” Bush said, contradicting earlier statements by the state’s top environmental regulator. Because of that, and because of concerns about global warming, Bush said, Texas should move away from coal-fired power and “transition to a natural gas-based energy economy and then, in the long term, renewables.” The state is already on its way to doing that, he added. Not only are those views an anathema to the coal lobby, which is a major backer of conservative Republicans nationwide; they are also decidedly more moderate than those of other ambitious Republicans here. Both Gov. Rick Perry and Attorney General Greg Abbott — Perry’s likely successor — have blasted the recent federal climate rules and questioned whether carbon dioxide emissions are dangerous to the public. Garry Mauro, who served as Texas’ land commissioner from 1983 to 1998 and was one of the last Democrats to be elected to statewide office here, said he was “shocked” to learn of Bush’s thoughts on climate change and its impact on the state. He attributed them to the fact that Bush does not have to worry too much about Republican politics right now: He breezed through the party’s primary last spring, easily defeating a Tea Party challenger. And he faces a long-shot Democrat, former Mayor John F. Cook of El Paso, in November. Perhaps Bush is plotting out his “long-term strategy,” said Mauro, by looking to gain a broader voter base. Indeed, Bush, whose mother was born in Mexico, has talked often of the need to usher more young people and Hispanics into the Republican Party — and he is widely believed to have higher political ambitions than land commissioner. “He’s young. He wants to be governor. You know, he wants to be somebody who can bridge these gaps,” said Heather Taylor-Miesle, director of the Natural Resources Defense Council’s Action Fund, the political arm of the advocacy group that drafted the Obama administration’s most recent climate regulation proposal. If he is elected, she said, by the time Bush’s first term is over, “a lot of the stalwart, more conservatives will be quite old and they’ll be dwindling. He’s trying to create a model for the 2020 election.” Bush said he is not ready to think about future political campaigns. The General Land Office, which the Texas land commissioner leads, is not the primary agency that oversees the state’s energy mix. If elected, however, Bush would be managing the revenue generated from oil and gas drilling on millions of acres of state-owned land, money that goes into a public education fund. Previous land commissioners have started or expanded programs that promote natural gas-powered vehicles, made some of the state’s first wind power purchases and installed renewable energy generators on public land to diversify the education fund’s income stream — all efforts Bush said he is committed to continuing. The agency is also deeply involved in protecting Texas’ 367-mile Gulf Coast, which has become increasingly vulnerable to sea-level rise, coastal erosion and storm surges that scientists say are all exacerbated by climate change. Noting that he was born in Houston, which is both home to Texas’ energy industry and susceptible to hurricanes and rising seas, Bush suggested that if Texas increased its spending on coastal protection, it could get more federal matching dollars. “For every dollar that the state spends, we can get $3 from the feds, roughly speaking,” Bush said, referring to a specific program in which the state and federal government partner on coastal issues. That kind of joint state-federal collaboration does not sound like a Tea Party talking point. And Bush’s views on environmental policy, in fact, seem to better reflect those of his relatives. His father, Jeb Bush, has made public statements on the advantages of natural gas from a carbon emissions standpoint and dealt with coastal concerns as Florida’s governor. And George H.W. Bush, Bush’s grandfather, was an early actor on global climate treaties more than two decades ago. “I think there’s a lot to build upon,” Bush said of that family legacy. Allison DeFoor, who worked as an environmental adviser to Jeb Bush while he was governor of Florida, said he was not surprised to hear of the younger Bush’s opinions, adding that his father is someone who chooses data over ideology.